Slasher movies are very much a staple of 1980s pop culture. From long-running franchises like Friday the 13th to lesser-known cult gems like Madman, The Burning, and Sleepaway Camp, slasher flicks from the '80s have still remained popular with old-school devotees of the horror genre. But it should be noted while the hottest period for this style of movie was the decade of excess, they're actually a product of the '70s. Released in 1978, John Carpenter's all-time classic Halloween set the bar for all slasher movies to follow, earning a reputation as one of the true masterpieces of the horror genre as a whole. And let's not forget that it's the first  and as of this writing, the only  movie of its kind selected for preservation in the Library of Congress's National Film Registry. Halloween is often hailed as the first true film of its kind, but some won't hesitate to bring up a particular film helmed by Porky's director Bob Clark. Predating Halloween by four years, Black Christmas helped to create many of the themes that have now become oft-noted clichés. And while a lot of movies have ripped off Halloween over the years, quite a few owe a debt of gratitude to Black Christmas for getting the ball rolling. Christmastime has come to the Canadian town of Bedford, where a group of sorority sisters at the Pi Kappa Sigma house are celebrating the holiday before heading home for their winter break. Unbeknownst to them, however, someone has decided to crash the party. Someone has crept into the sorority house's attic through an upstairs window, watching and listening as the girls go about their business. The girls are none the wiser, but they soon begin receiving phone calls from an unknown caller. What begins as obscenities grow to more bizarre, nonsensical ramblings, with the caller actually speaking in more than one voice. The sorority's token loudmouth drunk, Barb (Margot Kidder), blows him off as just another loony, but the calls have obviously rattled the rest of the girls. But though they're unnerved by it, they don't give them a lot of thought either... until one of the group goes missing. When the missing girl's father and the other sorority sisters are unable to find her, the local police put together a search party led by Lieutenant Fuller (John Saxon). But as the search progresses, the disturbing calls continue. Left to deal with it by herself while the other members of the sorority leave for home or help with the search, Jess (Olivia Hussey) must put up with not only the calls, but her high-strung boyfriend Peter (Keir Dullea), who's not exactly in a pleasant mood when he hears the news that Jess is pregnant and wants an abortion. She finally decides to stick it to the perverted caller and has the cops put a trace on the phone. After numerous calls, the police determine that the calls are coming from  uh oh!  inside the house. And that's when Jess discovers the second half of the scary truth. Not content to stay hidden in the attic, the intruder has slipped down into the house and started picking people off one at a time. Knowing that somewhere in the house lurks a psychotic murderer, Jess is forced into a cat-and-mouse game against him in order to save her own life. As I said in the opening paragraph, Black Christmas is recognized by many in the horror community as being something of a benchmark in the sub-genre of slasher films. You can definitely see where all those movies got their start, as Black Christmas boasts creepy POV shots, haunting music, a holiday setting, character constructs, and various scenes and ideas that would become clichéd. The fact that it doesn't follow the typical formula (since, naturally, there was no formula at the time) sets it apart from the multitude of slasher movies that dominated the 1980s, but that isn't necessarily a bad thing. I'll go out on a limb and say that Black Christmas's enduring popularity may primarily be due to Bob Clark's fantastic direction. His work here is exemplary, as he teams with cinematographer Reginald Morris to give the movie an unsettling visual feel that really takes the movie above and beyond what you may expect of it. (Those frightening shots from the psycho's point of view are to die for, too.) The first thirteen minutes and the closing half-hour are the best horror movie filmmaking I've ever seen, and I commend Clark and Morris for their work. And greatly helping the visual aspect of the movie is Carl Zittrer's music. His piano-driven score, combined with the ambient noise used on the soundtrack as well, really sets the tone for our psycho's state of mind and pulls us deeper into the movie. Next is the screenplay penned by Roy Moore. When I saw the movie for the first time, I wasn't exactly sold on the script. Outside of a few really creepy scenes and a kill or two, there isn't much else going on for nearly an hour in the middle of the movie. I guess I'm used to the more formulaic slasher movies that I grew up watching, but the movie's middle half drags at a snail's pace. There isn't a whole lot of suspense during this period because there's very rarely anything that builds suspense. However, while it drags in spots and there's a lot of stuff that doesn't contribute whatsoever to the story, the scenes involving the killer that are sprinkled in there really help put something of a dangerous undercurrent to the seemingly mundane proceedings. I know it may sound like I'm giving Moore's script a thumbs-down, but the positives far outweigh the negatives. The characters are likable for the most part, the majority of the humor is funny, and the killer is genuinely scary. And how about that killer? All of the scenes involving him really makes all that other boring stuff worth sitting through, and the beauty of it is that we know absolutely nothing about him. We don't know his name, we don't know what he looks like, we don't know his motivation. We're left completely in the dark about him, and this really works in the movie's favor. What's scarier than the unknown? Nowadays, every horror movie villain has some ultra-elaborate origin story that completely kills their mystique. Freddy Krueger, Michael Myers, Leatherface, Hannibal Lecter, Norman Bates, Jigsaw from the Saw movies, the ghosts from The Ring and The Grudge... they've all had somebody tell every little detail about their histories. It even happened in the remake of the very film I'm reviewing right now. But the fact that the killer isn't specifically identified or even shown, outside of a few inconsequential features (such as his hand, or his eye peeking from around a door), makes him so much more frightening. Lastly is the movie's cast, who are really good. Leading lady Olivia Hussey is charming and sweet. She is quite believable in the role, conveying the growing feelings of dread and fear that is needed to make the character work. I also thought John Saxon turned in a strong performance, but then again, when hasn't he? Keir Dullea is intense as his neurotic (and very, very suspicious) character, and every time he's onscreen, you get the feeling that he's one bad day away from becoming completely unhinged. Perhaps the best performance, though, comes from Margot Kidder. Four years before her career-defining performance as Lois Lane, Kidder is wholly entertaining as the opinionated, perpetually drunk loudmouth who has a hard time thinking before she speaks. She practically makes the whole movie by herself with her funny performance. There's one cast member that I wasn't too fond of, however. Marian Waldman, who plays sorority house mother Mrs. Mac, annoyed me to no end. She's supposed to be part of the movie's comic relief, but the "kooky alcoholic" shtick didn't strike me as funny. And Waldman's performance is so awful, so painfully annoying, that I cheered when the killer takes her out. It is amusing, though, to see all the elaborate places she's thought of to hide her booze. Hollowed-out books, toilet tanks, a hidden compartment in the closet, you name it. You know, now that I think about it, they should have invented a time machine and sent Roseanne Barr back to play Mrs. Mac. The character strikes me as being the Roseanne type, and with her in the role, the character might have been halfway entertaining. Halloween may be the innovator of slasher movies, but Black Christmas is the originator. And for that, it earns my respect. It's definitely worth at least one watch, as it features some great cinematography, a cast that enjoys what they're doing, and some actual scary moments. Not those cheap "boo!" scares that are all the rage in modern horror cinema, but the real thing. While I found it had a few irritating flaws, and I didn't like the fact that you could literally fast-forward through half the movie and not miss anything of any real note, the other half of the movie really swings my opinion in its favor. Though not a "slasher movie" in the truest connotations of the term, the movie made a lot of headway in establishing a prototype that other, better movies would improve upon. (It was also ripped off by other, crappier movies too, since the original When A Stranger Calls was like a poorly-made clone of Black Christmas.) This flick may not be done in the same style that fans of the sub-genre may be expecting, and it may not completely live up to the hype, it's still an fun movie nonetheless. 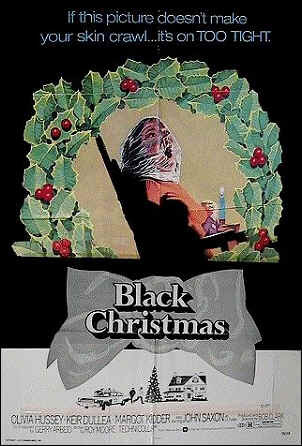 And to think, Black Christmas was made by the same guy that made the family-friendly A Christmas Story nine years later. Bob Clark knew how to make Christmas movies, for sure.